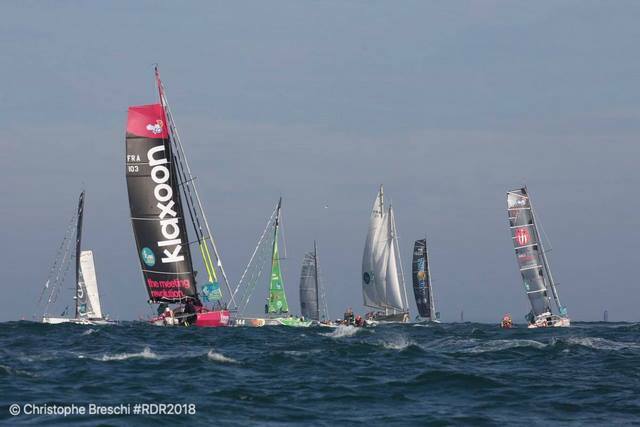 The majority of the 123-strong Route du Rhum-Destination Guadeloupe solo transatlantic fleet has enjoyed a brisk first 24 hours of racing as they head west into the Atlantic. But while most have settled into the race without major problems, there have been early difficulties for a minority of competitors. 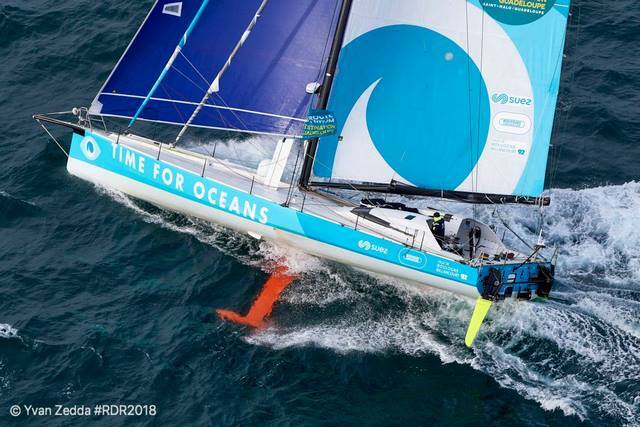 Among them are some of the most closely followed boats, including that of Seb Josse and Thomas Coville in the ULTIME class and Jérémie Beyou on board Charal – the newest boat in the 20-strong IMOCA fleet. 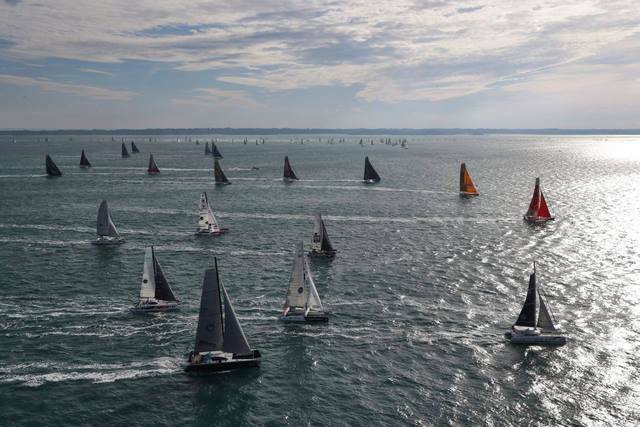 Those sailors apart, the opening stages have seen the fleet make rapid progress from the start off Saint Malo on Sunday where hundreds of thousands of people came out to watch, as the sailors made the best of fresh south-southeasterly winds in the opening stages of their 3,542-nautical mile voyage to Guadeloupe. 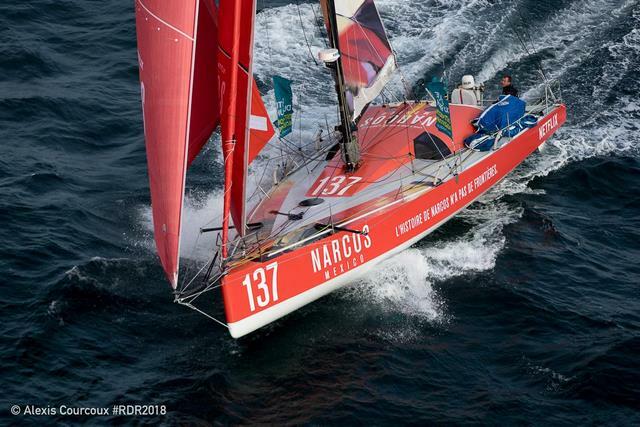 Once passed Ushant the choice was whether to head north around the Traffic Separation Scheme at the tip of Brittany or go south and, in the IMOCA fleet, Alex Thomson on Hugo Boss led the way on his own in the north. The move has paid handsome dividends for the British skipper as he continues to lead the division going into day two from Vincent Riou on PRB and Paul Meilhat on SMA. 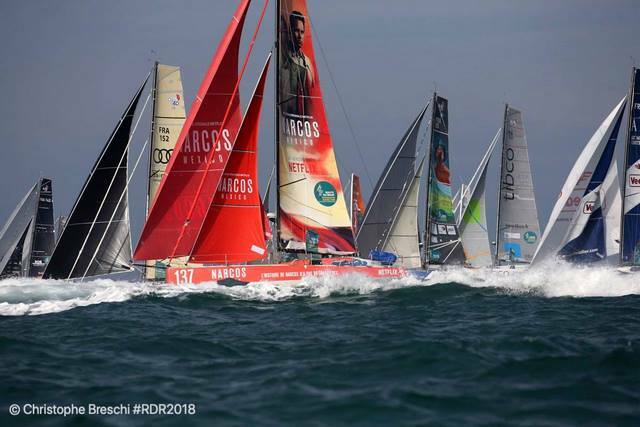 Behind the IMOCAs the battle at the front of the Class40 fleet has been as competitive as might be expected with a tight leading group separated by just a few miles on the water, led by Yoann Richomme on Veedol AIC. Britain’s Phil Sharp in seventh place on IMERYS CLEAN ENERGY has already had to deal with his first technical failure when an internal ballast tank inspection hatch failed, sending 500 litres of water into the boat. Sharp bailed it out and has made running repairs. 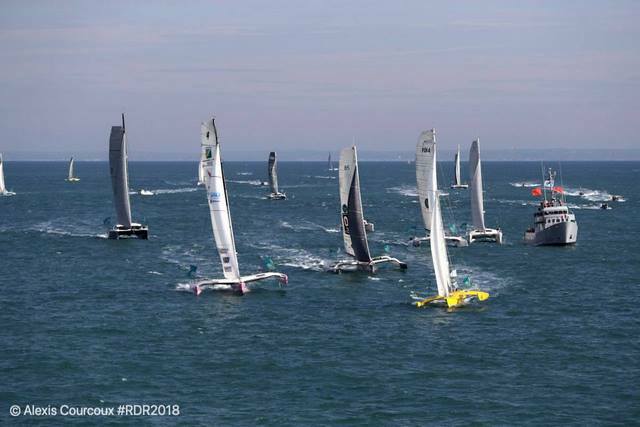 In the wake of the Class 40s the amateur Rhum Multi and Rhum Mono classes have been making good progress with a handful of boats – among them Loïck Peyron on the small yellow trimaran Happy – choosing to head for shelter in Brest and other Brittany ports to ride out the storm forecast to hit the fleet tomorrow. In his first message from on board, the irrepressible Peyron wrote: “Hello, Happy here. The departure from Saint Malo was beautiful, sailing through the rocky waters surrounded by dolphins and all sorts of lighthouses. We then hit choppy seas. “The Bay of Biscay is grey,” he continued, “but there is a little blue sky on the horizon and a little ray of sun which helps with my viewing through the sextant. I will head as quickly as possible to the shelter of the north coast of Spain before the storm falls on Happy, who for the moment is very happy." 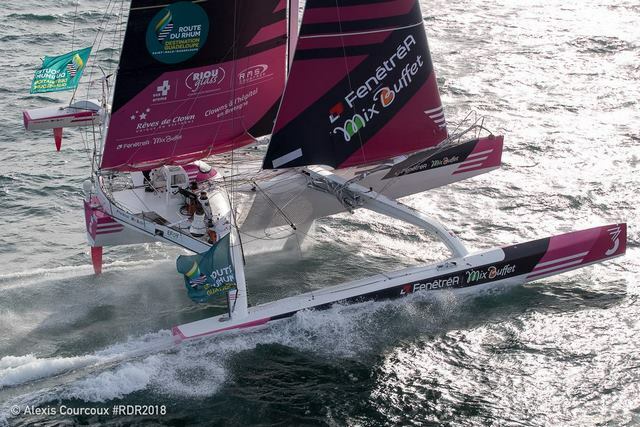 The first boat to hit difficulties was Josse’s ULTIME, Maxi Edmond de Rothschild, which came to a sudden stop from 25-30 knots of boatspeed just before dawn in the Bay of Biscay at about 135 nautical miles northwest of La Coruna, Spain. The Frenchman went on deck to discover a large part of the forward section of his starboard float had broken off. Cyril Dardashti, Managing Director of Josse’s campaign, said this was a hugely disappointing blow for Josse who had been tipped as a possible race winner. "We don’t know if he hit something,” he said. Next to hit trouble was Josse’s fellow countryman Thomas Coville whose Sodebo Ultim’ developed structural problems in one of its forward beams. This has forced Coville also to head to La Coruna to assess the damage with his team. 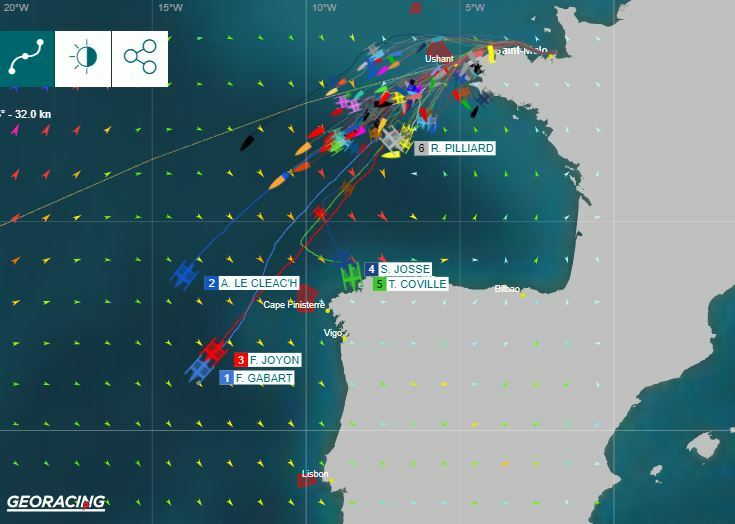 While Gabart now leads, he is being chased by Armel Le Cléac’h on Banque Populaire who made a short pitstop off Roscoff but is now back to just 18 miles behind with Francis Joyon on IDEC Sport only another seven miles back in third. 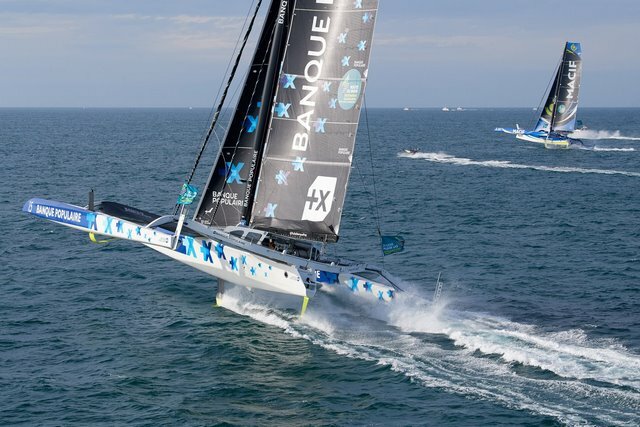 For Beyou, meanwhile, his first race on board the brand new VPLP-designed Charal, which sports large foils and an innovative hull design, has not gone as he might have wished. After sailing at the front of the fleet in the early stages, Beyou slipped back in light airs overnight but then reported steering problems which have effectively stopped him in his tracks. In each class the Brittany Ferries 24-Hour Trophy has been awarded to the skipper that achieved the greatest distance during the first full day at sea. 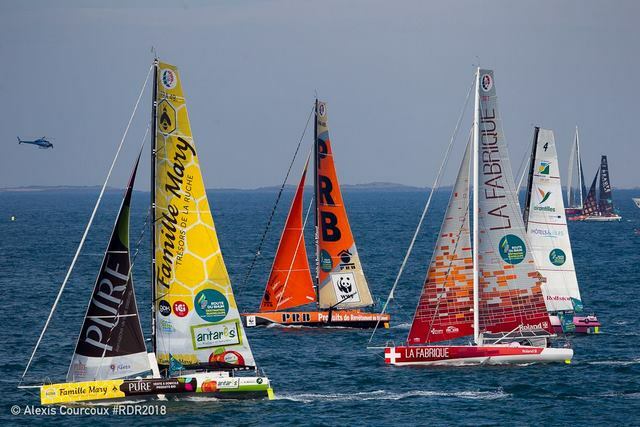 The winners were Gabart in ULTIMEs, Lalou Roucayrol (Arkema) in Multi50s, Thomson in IMOCAs, Luke Berry (Lamotte Module-Creation) in Class40s, Sidney Gavignet (Café Joyeux) in Rhum Monos and Pierre Antoine (Olmix) in Rhum Multis. 3 Wilfred Clerton (Cap au Cap Location) +31.68 miles behind.